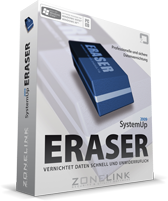 SystemUp Eraser is a computer safety software that can deep erase sensitive data in your computer, makes these data can't recovery again. The application comes from ZoneLink, the retail price is 29.99 €. Actually, German Chip magazine gives away registration code of SystemUp Eraser 2009, so we can get it for free now. Just grab this code below without register an account. You can direct download file here or go to official site check out. This software only for Windows XP, Vista 32 Bit/64 Bit.